Note – We received a copy of I Am A Hero from Funimation in exchange for our fair and honest review. 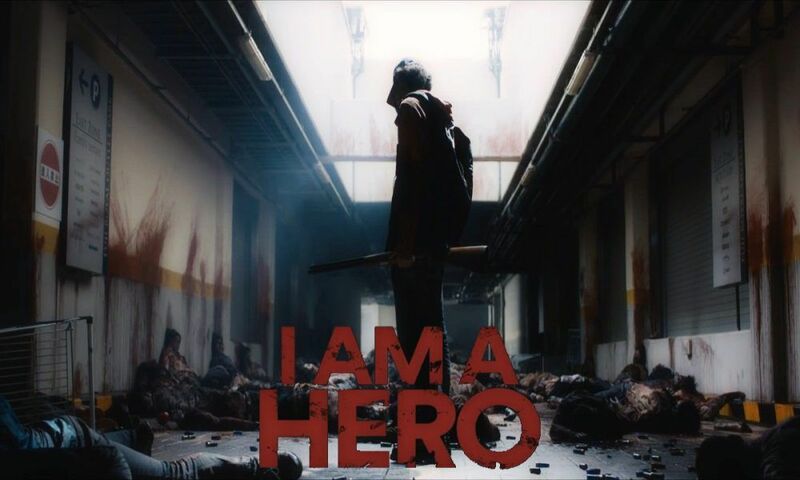 With a refreshing take on the zombie apocalypse trope, I Am A Hero manages to breathe new life into a familiar genre by unpacking layers of cultural and psychological commentary. Central to its uniqueness is the hapless, soft-spoken, aspiring manga artist – Hideo, who stands out in post-apocalyptic Japan due to his rare and powerful boon: a shotgun. Based on the hit manga by the same name, I Am A Hero centers around Hideo Suzuki: a 35-year-old working in a dead-end job as a manga artist assistant. His days are largely filled with fantasies of being a bolder version of himself – the kind that could stand up and talk back to his boss, or rally his co-workers. In reality, he largely keeps to himself, writing painfully predictable manga strips that are continually rejected by editors to the increasing frustration of his longtime girlfriend, Tekko. There is something very unique about Hideo, however: his status as a gun owner. Though it’s largely kept locked away, Hideo owns a shotgun and relevant license – a status that only .002% of Japan’s total population can claim. After his most recent attempts at getting published is rejected once again, Tekko insists he sell the shotgun so they can make rent. Hideo protests, saying that he can’t just sell it to anyone, which causes Tekko to lash out at him – exclaiming that he’ll never amount to anything, and that she’s tired of waiting. She kicks him out in a rage, with only his shotgun at his side. As she does so, Hideo asks her for just one thing: the license for his shotgun. Tekko angrily tosses it out of the slot and Hideo finds himself on the streets. Meanwhile, strange happenings have been occurring throughout the country: violent, sudden attacks are making the news daily as a mysterious flu epidemic continues to spread. As Hideo drifts to sleep on a bench, a quivering older man is seen nearby, and we begin to see the early iterations of the zombie outbreak known as “ZQN” that soon has the entire country overrun. In the chaos the follows in the next 48 hours, Hideo finds himself in the unfamiliar position of being relied upon. Battling horrifying zombies and morally bankrupt survivors, Hideo will discover whether he has what it takes to be a hero. With a trope as familiar as a zombie apocalypse, it can be easy to lose the viewers interest early on by falling into a predictable pattern of storytelling. While I Am A Hero doesn’t necessarily hit the ground running, it does do a great job of drawing you in with its protagonist – largely because his circumstances resonate with the struggle of 30-somethings who feel stuck on a hamster wheel. While the commentary can be expected to strike a chord in Japan, where conversations around NEETs and the increasing concern over young adults not having children continue to be commonplace, it’s also surprisingly potent medicine for the American viewer as well. Millennials, stagnated by the Great Recession, sometimes find themselves in a similar situation – the familiar scenario serves as an impactful reminder. Moving past the early drama, the action really starts to pick up about 20-30 minutes in. The chaos and pandemonium of a zombie apocalypse in Japan is definitely interesting – particularly the point that many still don’t realize what’s going on until hordes of ravenous zombies are literally attacking people in the streets. Carl Horn, longtime manga editor for Dark Horse, commented at Anime Expo this last year that one of the author’s biggest inspirations for writing I Am A Hero was the desire to showcase how a zombie apocalypse would look different in countries like Japan, Britain, Russia…places outside of the United States. One of the points that is made early, and often, is how guns are extremely rare in Japanese society. When Hideo comes across a survivors encampment at an outlet mall, we find that they are poorly armed: some literally fighting off zombies with golf clubs and airsoft guns. The most impactful weapon they have is a crossbow that fires oversized nails. While Hideo’s shotgun stands out as a powerful weapon in this zombie wasteland, it also makes him a target to other survivors, as the second half of the film fleshes out in some detail. Some of the zombie costumes & effects are laughably bad, while others, such as the “final boss” so to speak, are uniquely threatening and well-executed. This speaks to a general theme that I found in I Am A Hero, in that it seems to fluctuate between moments of self-deprecation and an earnest desire to bring something new to the table. The acting is solid, particularly Yô Ôizumi’s performance as Hideo. The bumbling protagonist does the best that he can, though his indecision and insecurity, even in the face of certain death, can be more than a little frustrating to watch. Later joined by Tsugumi Oda (played by the talented Masami Nagasawa, whom you might recognize for her performance in Your Name), we get to see Hideo break out of his shell more and more as the film goes on. Overall, I Am A Hero is an entertaining zombie-romp that adds flavor to a decades-old recipe. While the story eventually falls into a predictable end, it is elevated by social commentary that is surprisingly relatable on both sides of the Pacific, as well as stunningly violent action from beginning to end. It is sure to check a number of boxes for fans of zombie films, anime, manga, or all of the above. Interested? You can pick up a copy here! While the journey is compelling, the plot can be painfully predictable.